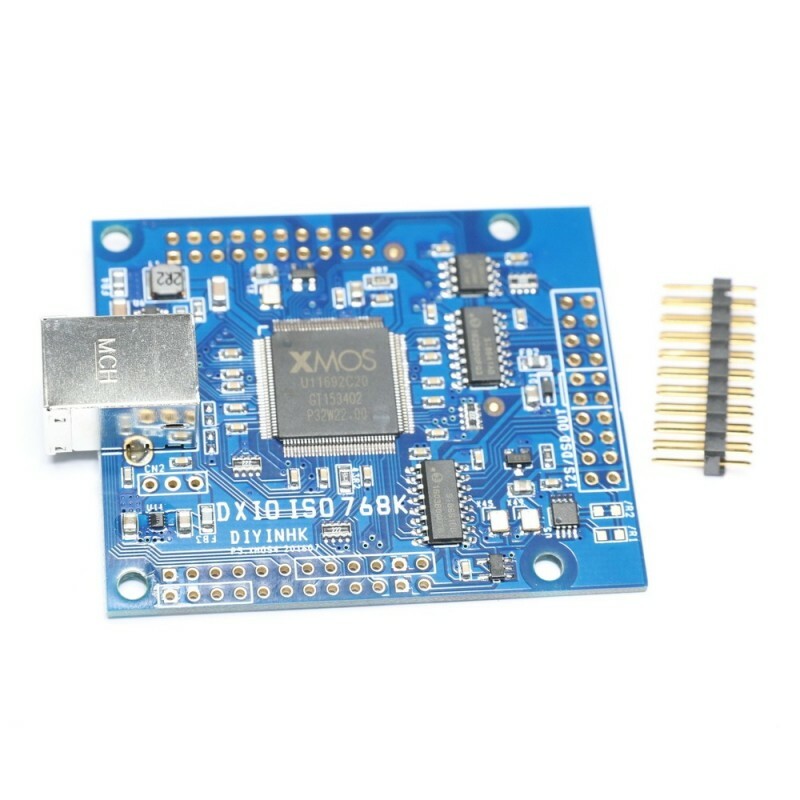 1) The latest xmos xCORE-200 includes unique hardware divider and it is used to generate the I2S bit-clock from the oscillator directly(old xmos uses software divider). Asynchronous reclock usb audio data to I2S signal for all the modern DAC standard input. 2) Audio oscillators 45.158Mhz and 49.152Mhz are located on the clean isolated side for highest performance. 8) Full copper one piece housing, gold plated(not cheaper gold flash) high quality Molex USB connector. 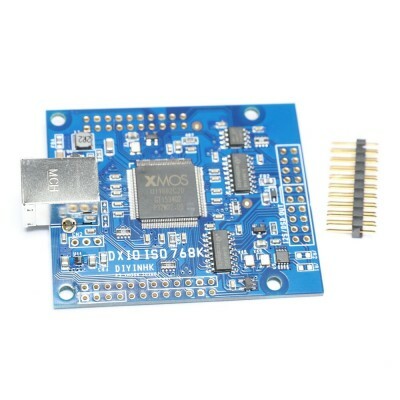 1 The isolated clean side is powered by external regulated 3.3V(>100mA) from the 20pin header labelled 3.3vINx2 and GND, it is usually connected to the same 3.3v digital power the DAC is using(warning: over-voltage or reverse-voltage can damage the xmos chip immediately, double check before power on). 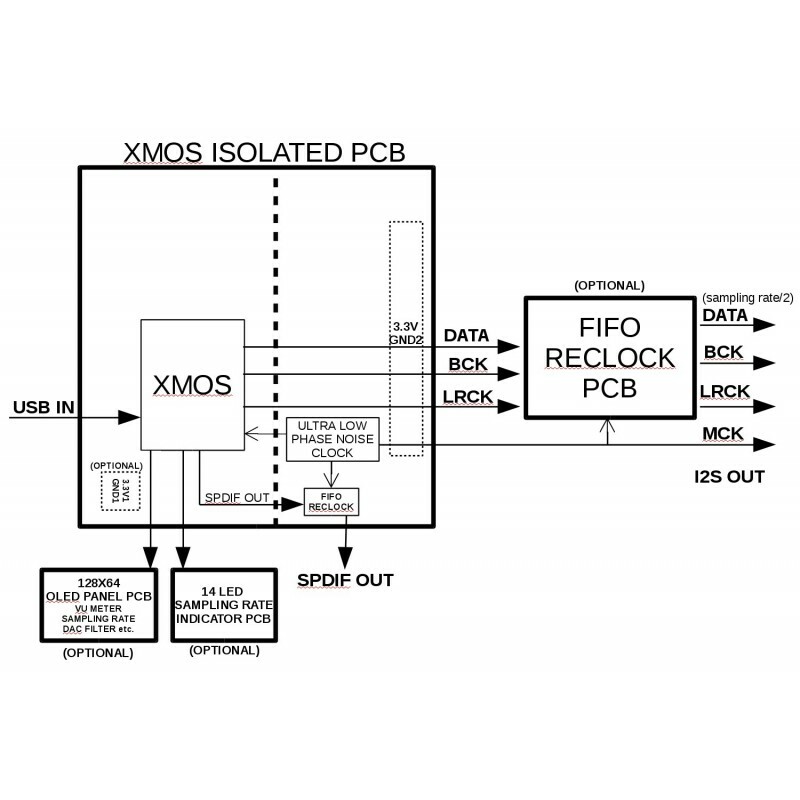 Xmos will not start until it can detect the 3.3V on the isolated side is present. 5. Our 768K PCB is pin to pin compitiable with our 384k PCB, user can replace and upgrade directly. 7. Exterme user can cut the trace under /R2 and short /R1 for 45.158Mhz/49.152Mhz MCLK frequency output if needed. *OEM are welcome, large discount on volume pricing, free customized logo on the bottom right corner of the OLED display for 50pcs+ order.